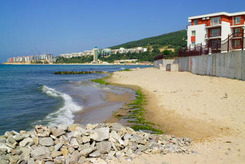 Location: The modern resort of Elenite is situated east of Sunny Beach and 50km north of Bourgas at the foot of the beautiful Balkan Mountain. Places of Interest: Besides the must-see old town of Nessebar, situated to the south of Elenite, the Emine cape to the north - which together with Kaliakra is the most popular Bulgarian Black Sea cape among visitors - is also a beautiful sight. Accommodation: The holiday complex is designed as a park, and offers one-family bungalows and luxury villas surrounded by green parks. Tes resort has its own private beach, several luxurious restaurants, sports facilities, a tennis court and equipment for water sports.